Reference number for this case: 5-oct-54-Loctudy. Thank you for including this reference number in any correspondence with me regarding this case. "My Martian was unshaven and had eyes as big as a raven's egg"
The daily chronicle of the "flying saucers" is becoming increasingly important. Every day, many news dispatches tell about the mysterious craft passing in one or the other region. The question is whether the bad weather that meteorologists are forecasting complacently, has any influence on the graceful evolutions of the visitors from the ether. It does not seem so, so far. To see a craft in the sky doesn't have anything special anymore and one could fear monotony if, fortunately, the "celestial pilots" would not come from time to time for a walk on dry land and make of their size, their outfit and their doings, extra spice to the current controversy about the reality of the "saucers". "He looked like a man"
In this context, the ephemeral newsmaker of today is a modest bakery worker from Loctudy (the Finistère), Mr. Pierre Lucas. [... appro]ched me. Before I could recover from my surprise, he tapped me on the shoulder while uttering unintelligible words." Quimper, October 6. -- Towards 4 o'clock, yesterday morning, Mr. Pierre Lucas, working baker in Loctudy (the Finistère) who was occupied drawing water in the court of bakery, saw suddenly in the night, a machine of the shape of a saucer of 2,50 m to 3 m of diameter. He saw an individual measuring approximately 1,20 m emerge of it, who approached him and tapped to him on the shoulder while uttering unintelligible words. The workman baker succeeded in keeping his coolness and returned to the bake house where the unknown followed him. In the light, Mr. Lucas managed to distinguish the visitor: he had an oval face, entirely covered of hairs and the eyes of the size of a corbel's egg. The young man called his owner, but before the latter had the time to come down, the unknown as well as the saucer disappeared without leaving a trace. A beer salesman of Concarneau has, on his side, stated to have seen in the sky, two luminous discs of the form of round tables prolonged of a kind of tail. One of the discs was motionless while the other evolved in the vicinity. The two discs disappeared at the end of ten minutes after having launched a rocket. To see a machine in the sky thus is nothing extraordinary anymore and one could fear monotony if, fortunately, the "celestial pilots" didn't come from time to pay a short visit on the dry land and to bring with their height, their costume and their actions, more spice to the current controversies on the reality of the "saucers". Odorous, colored and inhabited, the "saucers" are also international. In Mantova, they passed in tight formations and one of them was detached from the group to make a small air carrousel show which lasted one hour... and blocked the traffic in the center of the city, the witnesses having gone down in the street for better seeing. QUIMPER. -- Around 4 o'clock, Tuesday morning, Mr. Pierre Lucas, bakery worker in Loctudy (the Finistère) who was busy drawing water in the court of the bakery, suddenly saw in the night a machine in the shape of a saucer of 2 m. 50 to 3 meters in diameter. He saw come out of it an individual measuring approximately 1 m. 20 who approached him while articulating unintelligible words. The bakery workman managed to stay calm and returned to the bakery house where the unknown followed him. In addition, the "Martians" also seem to want to visit Italy. Indeed, a fisherman of Roverbella, province of Mantova, stated to have been approached by a "mysterious individual", dressed in red, which would have spoken "unintelligible words" to him, and which would have quickly moved away before the fisherman had the time to call his wife. A HAIRY "MARTIAN" FOLLOWS TO THE BAKE HOUSE A BAKER OF BRITTANY! But the most sensational observation, a little too sensational, but ultimately we are not used anymore to be afraid of the most incredible, was made yesterday in the Finistère. Around 4 hours of the morning Mr. Pierre Lucas, bakery workman in Loctudy, who was occupied to drawing water in the court of bakery, suddenly saw in the night a craft of the shape of a saucer of 2,50 to 3 meters in diameter. He saw individual measuring approximately 1,20 meters come out of it, who approached him and tapped him on the shoulder while uttering unintelligible words. The bakery workman succeeded in keeping his coolness and returned to the bake house where the unknown followed him. In the light, Mr. Lucas managed to see the face of the visitor: he had an oval face, entirely covered of hair and the eyes of the size of an egg of corbel. The young man called his owner, but before the latter had the time to go down, the unknown had disappeared, as its saucer of which no trace was found. Since the saucers start to fly, one has always wondered who could operate them. By an association of ideas, as mean as it is inaccurate, some bad spirits implied that it was by alcoholics! In Loctudy, this week, a bakery workman saw one of these famous Martians. Similar to the hero of antiquity as for his single eye [*], he moreover had in the face covered with hair, except the chin (beneficial action of Gilette Bleue [**] undoubtedly). Pierre Lucas, the bakery workman of Loctudy, won the honor of the Press from his adventure - or his mishap. Here, he is seen on the spot of the appearance, between his owners. [**] Very popular brand of shaving blades. The big joke of the "Martians"
PIERRE LUCAS, bakery workman, had almost finished his task. The paste is in the furnace and while waiting that it cooks, it is necessary to clean the kneader. Pierre takes a bucket and leaves in the bakery's courtyard to get water from the well. What do you think Pierre Lucas did? Did he start to yell? Does he flee at full speed? It's not that usual all the same, in Loctudy, to see a flying saucer and a Martian in the court of the bakery. But no! Pierre is a real tough guy. Quietly, he returns in the bake house with the "individual" on his steps. There, in the light, he sees the facial features of the visitor: an oval face, much covered of hairs, and eyes of the size of an eye of crow. Good golly! Sure that the boss would like to see that. - Boss! Boss! Come see this! But the Martian, if he does not speak French, undoubtedly understands it, because here he goes springing out of the bake house, crossing the courtyard, climbing in his saucer and whoopee! Gone... Pierre Lucas's boss will not see the being with the eyes like crow eggs. Too bad... Really too bad, because two pairs of eyes are better than one. Loctudy, France, Oct. 11 (INS). -- The young man in the photo here is Pierre Lucas, a 20-year-old baker in the village of Loctudy, and he's pointing to the spot in the village street where he says he saw a "flying saucer" parker. It was like this: early Wednesday morning Pierre left the bakery to go to the village pump for water. On his return with a pail of same, Pierre was about to open the door when he felt a touch on his shoulder. He look [sic] around and there was a four foot something with huge head, big eyes and a bearded face. Behind this creature on the street was a round contraption, about nine feet in diameter. the four-footer talked, but Pierre was unable to understand, He dropped his pail of water and took off into the bakery yelling for his employer. When the boss came out, no little man with a huge head, big eyes and a beard. No nuttin. However, from at least five parts of the world today came stories similar to Pierre's. From Germany, Belgium, Egypt, Argentina, Lebanon and the French Cameroon, came stories of disks, cigar-shaped craft, mysterious blue lights and little men. VALENCIENNES, October 23 (A.F.P). - The "War of the Worlds" has not occurred in Anzin, where many people believes the other night, in an invasion of Martians. It was about 10 p.m. when some walkers circulating on the Anatole France avenue saw "luminous dots" in the sky. A person seized with fear, gave the alarm to the police station, while firefighters, on duty in a movie theater, flocked to the cries of witnesses in the street. The saucers were going faster and faster and led a hellish round at the great excitement of passersby who expected their landing. A firefighter even prevented motorists to drive with their headlights on. Ten minutes later, it was discovered that it was luminous reflections on glass insulators placed at the top of the mast of a high voltage power line. The "hairy Martian" of Loctudy (Finistère) was a savant goat! BREST, October 23 ("France-Soir" telegram). -- The mystery of the hairy Martian of Loctudy (Finistère) is finally solved. And the bakery worker who, at night, was followed in the courtyard of the bakery by a being with a face covered in hair and enormous eyes, recovered from his emotions, as well as the people of the town. The Martian was a learned goat belonging to a circus passing in the area and it had wandered into the yard of the baker. A HUGE FIREBALL arrested in Criteuil (Charente) the car of Mr. Fillonneau M., mason. The witness who had felt "a violent gust of air" found that the battery was discharged and the bulbs of his headlights were burned out. A LUMINOUS STOVE PIPE was observed by the country guard of Montboubert near Abbeville, Mr. Fernand Poirel. A CIGAR LIGHTER, which is then divided into three, was seen by many, many people in Schleswig (Germany). Our sciences and technology would go to the junk pile. What such a catastrophe would mean morally we can gauge by the pitiful decline of the primitive cultures that takes place before our eyes. The capacity to manufacture (interplanetary space ships) points to a technology towering sky high over ours." THE "MARTIAN" OF THE BAKER'S BOY WAS A CIRCUS GOAT! The mystery of the hairy Martian of Loctudy (Finistère) is finally over. And the workman baker who, in middle of the night was followed from the bakery's courtyard to the bake house by a being with a face covered of hair and enormous eyes, recovered from his emotions, as well besides as inhabitants of the commune. The Martian was only a savant goat belonging to a circus of passage and which had ventured in the court of the baker. 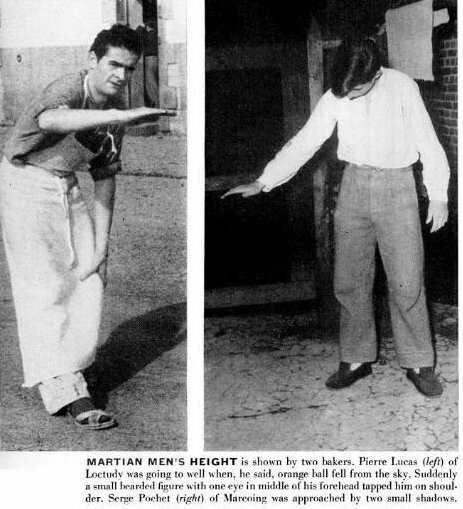 MARTIAN MEN'S HEIGHT is shown by two bakers. Pierre Lucas (left) of Loctudy was going to well when, he said, orange ball fell from the sky. Suddenly a small bearded figure with one eye in the middle of his forehead tapped him on the shoulder. Serge Pochet (right) of Marcoing was approached by two small shadows. Another [flying saucer occupant], bearded, with a single eye in the middle of his forehead, asked Pierre Lucas, a Breton baker, for a light. Lucas was so disturbed over the incident he couldn't remember just what language the saucerian spoke. Pierre Lucas, a baker's assistant of Loctudy, claimed he met a flying saucer pilot with a hairy oval face and eyes as big as crows' eggs. The four-foot saucerian landed in the bakery yard, came up to Lucas, tapped him on the shoulder and then muttered some unintelligible words before flying away. The author indicates that on October 5, 1954 around 4 hours of the morning Pierre Lucas, bakery worker in Loctudy in the Finistère, was busy drawing water in the court of the bakery when he suddenly saw at a few meters of him a circular craft, 2.5 to 3 meters in diameter, posed on the ground. Flabbergasted, he saw a being 1.20 meters in height coming out of it and approach him, touch his shoulder while uttering incomprehensible words. The witness succeeded in keeping his coolness and returned in the bake house where the unknown being followed. It had an oval face, cover of dark hairs, and what struck the witness was that it had enormous eyes, "the size of a pigeon's egg". The young man decidedly called his owner but the being at once retreated and reinstated its spaceship which took off without delay. When the owner arrived attracted by the call of the witness the machine had fled. Jimmy Guieu adds that a probable "deadpan" who sought to explain the case rationally claimed that it was simply a goat escaped from a circus, which Jimmy Guieu regards as a divagation led by the doubt in the minds of "know-it-alls". Michel Carrouges indicates that in October 1954 in Loctudy, Finistère, one of the 5 cases he knows of "hairy Martian" of the 1954 French flap occurred. In the event, he indicates, the testimony of Mr. Lucas was highly attacked for the reason that there is said to have been "a confusion with a savant goat escaped from a circus, according to a newspaper of Brest of October 24 (?)" Carrouges says that the height indicated by Mr. Lucas for the being was 1 m 20, and that Mr. Lucas did not see only the pilot from close distance but also the saucer, in the yard of the bakery where he worked, which makes it the only case among the five bearded Martians from the 1954 French flap in which a saucer is also reported by the witness. According to a news release by Agence France Presse (AFP) for October 6, 1954, Mr. Lucas had described the eyes of the being to be as large as "a corbel egg." Oct. 05, 1954, 04:00 Loctudy (France). The authors indicate that on October 5, 1954, at Loctudy, the Finistere, France, a baker, drawing water from a well at night, was surprised to see an object about 10 feet in diameter on the ground nearby. From the object emerged a small being with a face covered with hair and large eyes ''as large as the eggs of a raven." The strange little creature approached the man, touched him on the shoulder and made unintelligible noises. The baker called his boss, whereupon the dwarfish creature got back into the craft and it flew away. The author indicates that on October 5, 1954, in Loctudy in Finistère, a baker was getting water from his well in the middle of the night when he noticed, at some distance from there, an object of approximately 3 meters in diameter, of which emerged a dwarf which had an oval face covered with hairs and eyes which were "as large as corbels' eggs". The unknown individual touched the witness on the shoulder and spoke to him in a language which he did not understand. When the young man called his boos, the dwarf went back into his apparatus and it moved away. The two authors indicate that completely by chance, a travel led them the bigoudin country and that a fast glance at their file let them find a "Brittany Martian... and covered of hairs" in Loctudy, which is a classic case that all sources report about. "On October 5, around 4 hours of the morning, Mr. Pierre Lucas, bakery worker in Loctudy (the Finistère), who was busy drawing water in the bakery's courtyard, suddenly saw, at a few meters of him, a circular machine of 2,50 m to 3 meters in diameter posed on the ground. Flabbergasted, he saw a "being" of approximately 1,20 m height come out and approach and touche him on the shoulder while uttering incomprehensible words." "The bakery worker manages to keep his cold blood and returned in the bake house where "the unknown" followed him. In the light, Mr. Lucas could figure out the strange visitor. He had an oval face, covered of dark hair and, a detail which struck the witness, enormous eyes, "of the size of a corbel's egg." The young man called up his owner, but at once, the dwarf "Uranian" beat a retreat and reinstated his spacecraft which took off without delay. When Mr. Lucas' owner, attracted by his calls, arrived, the machine had fled." The authors indicate that they easily found this bakery worker in the small village, the first indication which they could obtain being "Oh yeah, what he saw is not serious, you'd rather check in the red wine and the whisky...!" They thus went in a bar in Quimper, where they say to have found their man, to have had a very difficult dialogue with him as he was obviously used to the place, he strongly showed his age, his state "certainly not due to an occupational disease." It did not want anything to say of his sighting and claimed to be unaware of the story. The next day in the morning, they found him at the same place, discussed, explained their "work, the studies which we undertake", and the witness "admits that his sighting is nothing to be taken seriously: "I was young... It was not serious, one showed me what was not there." The authors ask whether it was a prank, he answers: "Yes, a story, it wasn't serious." They conclude from it that the "hairy insects" Martians of 1954 are due to the effects of alcohol, or jokes of bar counters. (*) Barthel and Brucker, see above. The ufologist of Brittany reports in his book that Pierre Lucas, workman baker, was budy getting water in the yard of the bakery when he suddenly noticed a flying saucer a few meters away from him, of 3 meters in diameter and landed on the ground. Flabbergasted, he witnessed a being coming out of it, of 1 meter 20 height which approached him and touched his shoulder while uttering incomprehensible words. Mr. Lucas kept his cold blood and moved towards the bake house, followed by the unknown being. With the light, the witness could distinguish the strange visitor's feature: he had an oval face, covered with dark hairs, and, striking detail, enormous eyes. The young man called his boos for urgent assistance, but "the creature reinstated its machine which took off at once, letting believe that it was not only more advanced than us in the field of the technique, but also on that of prudence." The author indicates that it was on Sunday October 8, 1954 in a restaurant of Loctudy at a table of merry sailors-fishermen, that one of the merry chaps of the restaurant claimed that Pierre Lucas had seen a goat escaped from an unspecified circus. The story of the goat then circulated from newspaper to newspaper and was told on the radio. It was told that Brittany cruelly lacked flying saucers and that the case of Loctudy with its cosmonaut filled the gap. "Eyes as large as raven eggs." The making of bread requires that bakers be early risers and M.P. Lucas, a baker at Loctudy, was no exception. At 4:00 a.m. October 5th M. Lucas was preparing for a day's work by drawing a pail of water from a well when he saw a parked circular machine near by from which a "hairy dwarf" emerged. With a face covered with hair and with eyes the size of raven eggs, the little creature must have been quite a sight but M. Lucas said he permitted the "dwarf" to approach close enough to touch him lightly. The creature then uttered some sounds that may have heen words in an alien language. After that the "dwarf" climbed aboard his machine and flew away. 51. (Jacques Vallee suggests that suspicious similarities between this case and one at the town of Roverbella [Italy] indicates a hoax). 51. Lorenzen, Coral and Lorenzen, Jim. UFOs: Flying Saucer Occupants. New York, N.Y.: Signet, 1967. p.94. Jean Sider summarizes the case by saying that according to Giguet page 123, on October 5, 1954 in Loctudy in the Finistère, Pierre Lucas draws water in the yard of bakery where he works when it sees a circular craft posed on the ground at a few meters of him. A small hairy being comes out of the craft and approaches him, Pierre Lucas calls his boss but before the boss arrived, the strange creature reinstated its vehicle which took off and disappeared quickly. He then states that an investigation by LDLN demonstrated that the witness was truthful but that Barthel and Brucker claim on page 78 that the case is a prank by a notorious alcoholic. Jean Sider states that this is false since Lucas was 23 or 24 years old then and it "would have made of him a rather young alcoholic." He adds that Mr. Le Goff, Pierre Lucas's Boss, went on record to vouch of his serious and had specified that his employee had insisted that the police was called, a behavior in contradiction with that of a prankster. Jean Sider notes that at the time the newspaper France-Soir had told that it was an escaped circus goat and that he is astonished that Barthel and Brucker did not use this explanation, whereas they quote this newspaper very often. Jean Sider deduces from it that Barthel and Brucker never consulted the original sources and were satisfied just "to read files that are often dubious." Godelieve van Overmeire indicates that in 1954, on October 5, in France, in Loctudy (Finistère), Pierre Lucas, baker, was drawing water from a well at 04.00 of the morning, when he noticed an object at some distance from there. It was a round object approximately 3 m in diameter from where a dwarf with an oval face, covered of hair, emerged, with eyes as large as of corbels' eggs (as pigeons' eggs, in the version by Jimmy Guieu) who touched his shoulder to him and talked to him of an unknown language. The dwarf went away and the object flew away. The source for the above is given as Jacques Vallée: "Chronique des apparitions ET" - Denoël 1972 - Coll. J'Ai Lu - p. 268. Godelieve van Overmeire adds that Pierre Lucas, a bakery worker who was busy drawing water in the bakery yard suddenly observed, at a few meters of him, a "flying saucer", 3 meters in diameter, posed on the ground. Flabbergasted, he saw a 1.20 m tall creature coming out, who approached him before touching his shoulder while uttering incomprehensible words. Mr. Lucas kept his calm and moved towards the bake house, followed of the unknown being. In the light, the witness managed to check the strange visitor's face, he had an oval face, covered of dark hair, and, striking detail, enormous eyes. The young man called his owner for help at once, but the creature reinstated its craft which took off at once letting believe that it was not only more advanced than us in the field of the technique, but also on that of prudence. The source for this version is given as Jean François Boedec, "Les OVNI en Bretagne, Anatomie d'un Phénomène", Fernand Lanore publisher 1978, p. 103. October 5, 1954 at 4 hours of the morning. Loctudy (Finistere) the baker P. Lucas notices close to his well a round object three meters in diameter approximately from which emerged a dwarf with an oval face, covered of hairs, with eyes as large as a corbel's egg. The dwarf touched his shoulder and spoke in an unknown language. 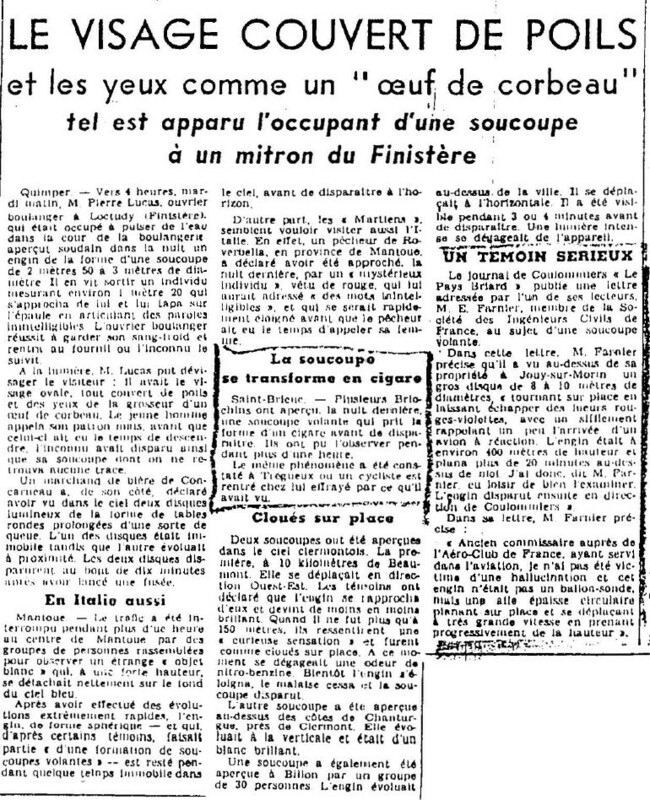 Article published in four French newspapers 7/10/54 (La Croix, Le Figaro, France Soir and Le Franc-Tireur). Tuesday October 5, 1954 at 4:30, in Loctudy (Finistere), Pierre Lucas, working baker, sees a "Martian", of which he sees only one eye, with the face covered of hairs, except the chin. At the time when the owner came running, alerted by the shouting of his workman, the being to disappear with his saucer. Lucas wins from his adventure - his mishap - the headlines in the Press. It was high as that the guy that I saw the other night. I went outside for a moment to go get water at the fountain. Suddenly, I see a ball of fire which comes down from the sky. No noise at all. In the wink of an eye, it lands in a meadow on the other side of the road. I distinctly saw the 3 feet which retained it on the ground. A yellow light lighted the higher part. And here is goes that an individual taps on my shoulder. I saw it as I see you. It had a bearded face and only one eye, but perhaps it had a mask. On its head, a helmet which resembled that of the motorcyclists. Sorts of wire like those of the antennas of TSF came out of it. Frankly, I was afraid. I dropped my bucket. I returned inside. My boss came out. There was nothing any more. It was a round object of approximately 3 m in diameter from where a dwarf with an oval face, covered of hairs emerged, with eyes as large as eggs of a corbel, which tapped his shoulder and addressed to him of an unknown language. The dwarf goes away and the object flies away (Franc Tireur, La Croix, France-Soir, Le Figaro, October 7). Figuet will regard the case as a joke by a notorious alcoholic (Barthel & Brucker. p. 73). Tuesday October 5, 1954 [... Other cas ...] and Loctudy (Finistère). Baker's assistant Pierre Lucas was drawing water from a well when he saw a ball of fire descend, resting on 3 feet, across the road. There emerged a 4-foot tall being with a hairy face and eyes the size of crow's eggs, wearing a helmet from which antenna like wires protruded. This being tapped Lucas on the shoulder and uttered incomprehensible words. Lucas ran for his boss, but when the baker came out there was nothing. The author indicates that in Loctudy in Finistère in France, in the night of October 5, 1954, P. Lucas, a baker of this village, drew water from the well when he noticed an object of approximately three meters in diameter posed at some distance. A small being came out of the machine, it had an oval head covered with hairs and eyes that were "as large as a corbel's eggs." This being touched the shoulder of the witness and spoke to him in an incomprehensible language. When this young man called his boss, the being moved away and returned in its apparatus which took off to disappear in the night. A baker was drawing water from a well when he noticed a 10' diameter object on the ground. A small being with a hairy face and large oval eyes approached him & spoke in a strange language. Baker called his boss & both watched as creature got into craft which took off quickly. Donald Johnson indicates that on October 5, 1954, in Loctudy, France, at 4:00 a.m. a baker, Mr. P. Lucas, was draining water from a well when he noticed an object some distance away. It was circular and about three meters in diameter. From it emerged a dwarf with an oval-shaped face, covered with hair, and big eyes "as large as raven eggs." The short being touched him on the shoulder and spoke to him in an unknown language. The dwarf then went away and the object took off. Donald Johnson gives the source as Jacques Vallee, Passport to Magonia, p. 218. Luc Chastan indicates that in the Finistère in Loctudy on October 5, 1954 towards 4 o'clock, the workman baker is busy drawing water in the court of bakery. He suddenly sees, a few meters from him, a circular craft posed on the ground. Flabbergasted, he sees a 1 m 20 tall humanoid coming out, who approaches and touches his shoulder while uttering incomprehensible words. The witness manages to stay calm and goes back into the bake house where the unknown follows him. In the light, the witness can check out the strange visitor's face. It is a 1 m 20 tell being, covered of dark hairs, with enormous eyes "of the size of a pigeon's egg", with an oval face. The young man calls his owner. At this time to be strange being retreats, goes up on board his craft which takes off at once. When the owner, attracted by his calls, arrives, the object had disappeared. Luc Chastan indicates that his sources are "CASAR par Gatti Francis ** http://perso.wanadoo.fr/casar" et "Ovni, Premier dossier complet... par Figuet M./ Ruchon J.L. ** éd. Alain Lefeuvre 1979". The website indicates that on 5 October 1954 at 04:00 in Loctudy, France, there was a circular object, three meters diameter. From it emerged a dwarf. The explanation was: Animals. "A baker, P. Lucas, was draining water from a well when he noticed an object some distance away. It was circular object, about three meters diameter. From it emerged a dwarf with an oval face covered with hair and eyes "as large as raven eggs" who touched him on the shoulder and spoke to him in an unknown language. The dwarf went away, and the object took off." The website comments that it is a "Close encounter with a an unidentified craft and humanoid occupants. One oval object, about 5 feet across, was observed by one experienced male witness in a city for ten minutes. One 4-foot-tall hairy dwarf, wearing a helmet and antenna, was seen." The website adds that "Baker's assistant Pierre Lucas was drawing water from a well when he saw a ball of fire descend, resting on 3 feet, across the road. There emerged a 4-foot tall being with a hairy face and eyes the size of crow's eggs, wearing a helmet from which antenna like wires protruded. This being tapped Lucas on the shoulder and uttered incomprehensible words. Lucas ran for his boss, but when the baker came out there was nothing." The sources are indicated as Webb, David, HUMCAT: Catalogue of Humanoid Reports; Guieu, Jimmy, Flying Saucers Come from Another World, Citadel, New York, 1956; Lorenzen, Coral E., Flying Saucer Occupants, Signet T3205, New York, 1967; Lorenzen, Coral E., Encounters with UFO Occupants, Berkley Medallion, New York, 1976, ISBN:425-03093-8; FSR, FSR (formerly Flying Saucer Review), FSR, London, 1966; Bowen, Charles, The Humanoids: FSR Special Edition No. 1, FSR, London, 1966; Pereira, Jader U., Les Extra-Terrestres, Phenomenes Spatiaux, Paris, 1974; Vallee, Jacques, Computerized Catalog (N = 3073); Vallee, Jacques, Challenge to Science: The UFO Enigma, Henry Regnery, Chicago, 1966; Vallee, Jacques, Challenge to Science: The UFO Enigma, Henry Regnery, Chicago, 1966; Vallee, Jacques, A Century of Landings (N = 923), (in JVallee04), Chicago, 1969; Schoenherr, Luis, Computerized Catalog (N = 3173); Carrouges, Michel, Les Apparitions de Martiens, Fayard, Paris, 1963; Delaire, J. Bernard, UFO Register Volume 7 (1976), Data Research, Oxford, 1976; Newspaper Clippings; Civilian Saucer Intelligence-New York; Hatch, Larry, *U* computer database, Author, Redwood City, 2002; Rosales, Albert, Humanoid Sighting Reports Database. A baker, Mr P Lucas was draining water from a well when he noticed, some distance away, a circular object about 3m in diameter. A dwarf with an oval face surrounded by hair and eyes “as large as raven’s eggs” emerged from it. It touched him on the shoulder and spoke to him in an unknown language. The dwarf went away and the object took off. 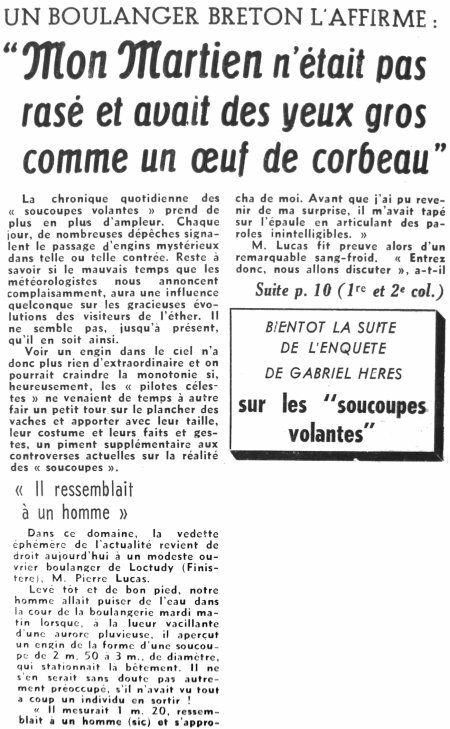 Vallee Case 196, citing Franc-Tireur + La Croix + Figaro all 7 October 1954. Heiden, citing Carrouges 1967, p.141. *Oct. 5, 1954 - Loctudy, France. At 4:00 a.m. a baker, Mr. P. Lucas, was draining water from a well when he noticed an object some distance away. It was circular and about three meters in diameter. From it emerged a dwarf with an oval-shaped face, covered with hair, and big eyes "as large as raven eggs." The short being touched him on the shoulder and spoke to him in an unknown language. The dwarf then went away and the object took off. (Source: Jacques Vallee, Passport to Magonia: A Century of Landings, p. 218, case # 196). Baker’s assistant Pierre Lucas was drawing water from a well when he saw a ball of fire descend, resting on 3 feet, across the road. There emerged a 4-foot tall being with a hairy face and eyes the size of crow’s eggs, wearing a helmet from which antenna like wires protruded. This being tapped Lucas on the shoulder and uttered incomprehensible words. Lucas ran for his boss, but when the baker came out there was nothing. This database recorded this case 20 times instead of one! The newspaper France-Soir of October 24,and other newspapers later, had an article in which it is claimed without further information that the witness had mistaken the flying saucer and its hairy occupant, which was really a goat which escaped from a circus. [-] indicates sources that I have not yet checked yet. [---] News release by Agence France Presse (AFP), France, October 6, 1954. [---] Article in the regional newspaper Ouest-France, France, page 3, October 6, 1954. [ll1] Article in the regional newspaper Le Lorrain, France, page 1, October 7, 1954. 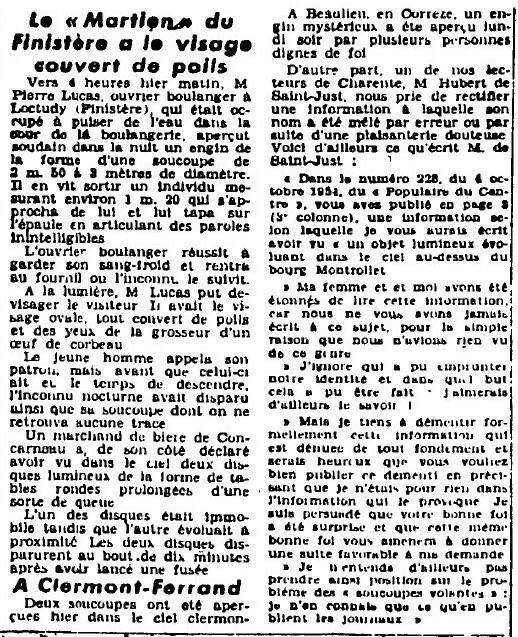 [vm1] Article in the regional newspaper Var-Matin République, France, October 7, 1954. [---] Article in the national newspaper Franc-Tireur, France, October 7, 1954. [---] Article in the national newspaper La Croix, France, October 7, 1954. [---] Article in the national newspaper France-Soir, France, October 7, 1954. 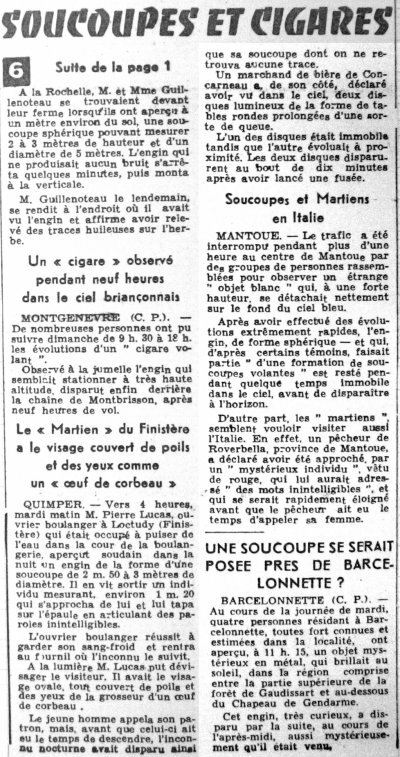 [---] Article in the national newspaper Le Figaro, France, October 7, 1954. 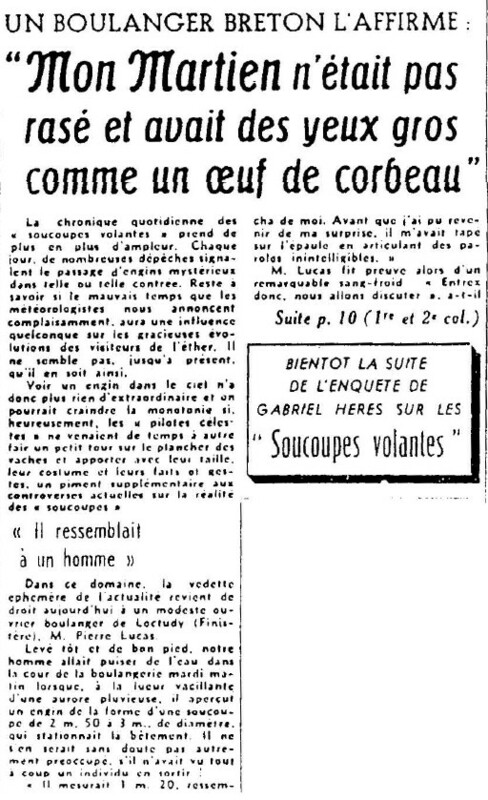 [pc1] Article in the regional newspaper Le Progrès de Cornouailles, France, pages 1 and 3, October 9, 1954. 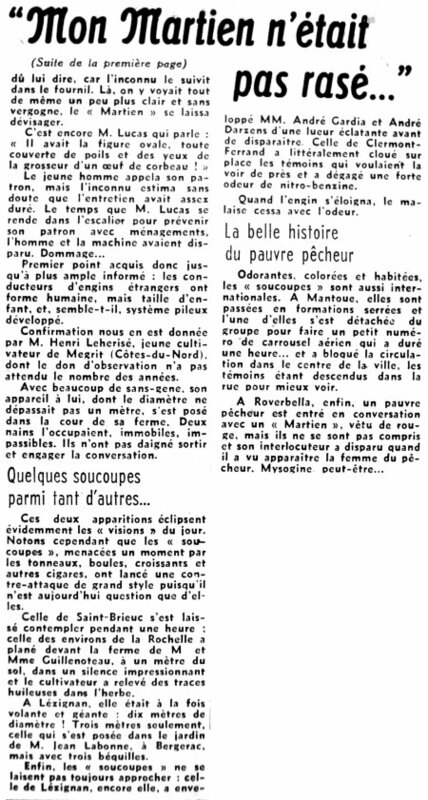 [ss1] Article in the national newspaper Samedi-Soir, France, October 14, 1954. [in1] News release by INS (International News Service), U-K., October 12, 1954. [fs1] Article in the national newspaper France-Soir, Paris, France, October 24-25, 1954. 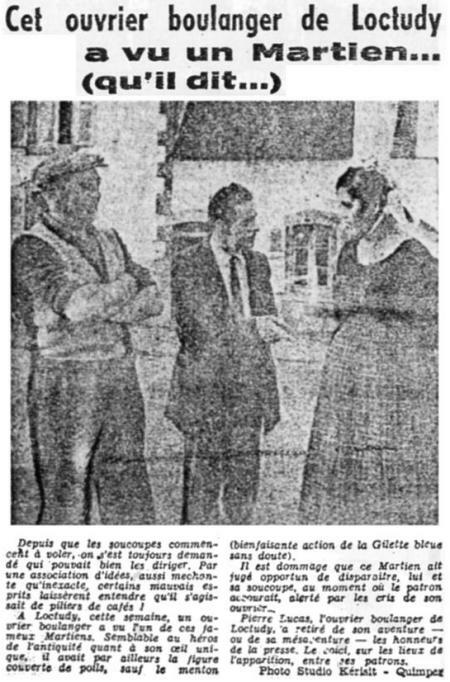 [qh2] Article in the regional newspaper Le Quotidien de la Haute-Loire, France, October 26, 1954. [li1] Part of the article "Astral Adventurers - Frenchmen report meetings with unlikely creatures", in LIFE Magazine, USA, page 28, November 1, 1954. [gb1] "Europe invaded by little men, article by Gray Barker, in his flying saucers magazine The Saucerian, Gray Barker editor, USA, Vol. 3, No 1, page 17 and page 20, January 1955. [---] Ufology group Civilian Saucer Intelligence (CSI), USA. [mc1] "Les Apparitions de Martiens", book by Michel Carrouges, (aka Louis Couturier), Fayard publisher, France, page 80, pp 107-108, 1963. [---] "Letter to the Editor", by Jacques Vallée, in the ufology magazine Flying Saucer Review (FSR), U-K., Volume 10, #3, May-June 1964. [lo1] "Flying Saucer Occupants", book by Coral and Jim Lorenzen, Signet Books publishers, USA, 1967. [jg1] "Black-Out Sur Les Soucoupes Volantes", book by Jimmy Guieu, Omnium Littéraire publisher, France, page 188, 1972. [lo1] "Encounters with UFO Occupants", book by Coral and Jim Lorenzen, reprint of "Flying Saucer Occupants", Berkley Medallion publishers, USA, 1976. [jo1] "Les OVNI en Bretagne, Anatomie d'un Phénomène", book by Jean François Boedec, Fernand Lanore publisher, France, page 103, 1978. [bb1] "La Grande Peur Martienne", book by Gerard Barthel and Jacques Brucker, Les Nouvelles Editions Rationalistes publishers, pp 72-73, 1979. [mf1] "Catalogue Francat des Rencontres Rapprochées en France - Listing 800", catalogue by Michel Figuet, 1982. [---] "Faces of the Visitors", book by Kevin Randle and Russ Estes, Fireside publishers, USA, page 266, 1997. [lg1] "The Fifth Horseman of the Apocalypse - UFOs: A History - 1954 October", monography by Loren E. Gross, USA, pp 10-11, 1991. [js1] "Le Dossier 1954 et l'Imposture Rationaliste", book by Jean Sider, Ramuel publisher, France, pp 67-69, 1997. [fg1] Case file by Francis Gatti, on the Internet. [jr1] "B.A. BA des Extraterrestres - Volume 1", book by Jean-Paul Ronecker, Pardès publisher, France, page 98, 2001. 0.1 Patrick Gross 3 octobre 2003 First published. 1.0 Patrick Gross January 5, 2009 Conversion from HTML to XHTML Strict. First formal version. Additions [js1], [lh1], [go1], [dj1], [lc1], [ud1]. 1.3 Patrick Gross July 7, 2010 Addition [ri1]. 1.4 Patrick Gross July 14, 2010 Additions [in1], [li1]. 1.5 Patrick Gross August 15, 2010 Addition [lm1]. 1.6 Patrick Gross October 21, 2011 Addition [lo1]. 1.7 Patrick Gross October 30, 2011 Addition [jb2]. 1.8 Patrick Gross November 2, 2011 A search on the web and in my documentation did not reveal other sources. In "Explanations", "Not looked for yet" changed to "Invention". 2.0 Patrick Gross September 16, 2014 Addition [ll1]. 2.1 Patrick Gross September 18, 2014 Addition [fs1]. 2.2 Patrick Gross October 8, 2014 Additions [ta1], [ni1]. 2.3 Patrick Gross December 18, 2016 Additions [lg1], [ub1], [gb1]. 2.4 Patrick Gross January 5, 2017 Addition [fs1]. 2.5 Patrick Gross January 9, 2017 Additions [hm1], [pc1]. 2.6 Patrick Gross February 7, 2017 Addition [vo1].